Australia Day is celebrated around the country on January 26. The national holiday is celebrated in a variety of ways including concerts, parades, beach parties, barbecues, and bake sales. Traditionally Australia Day commemorates the landing of the First Fleet in Sydney in 1788 thus marking British colonization of the continent. Australia Day also celebrates multiculturalism, diversity, and tolerance. What follows is a range of typically Aussie recipes encompassing traditional favorites to more modern-day flavors. 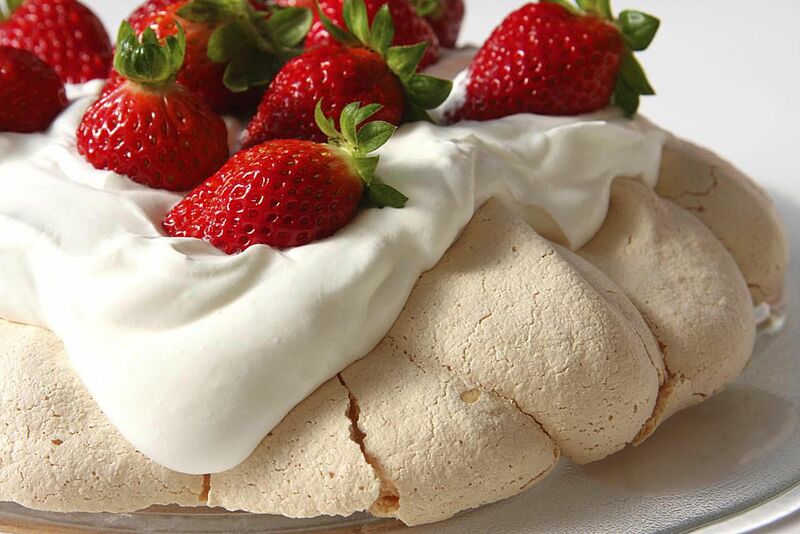 The Pavlova is New Zealand's national dessert. This delicate cake is part of a great debate between Australians and New Zealanders who both lay claim to its invention. The Pavlova is a meringue shell with a marshmallowy center topped with whipped cream and fruit. It was aptly named after Russian prima ballerina, Anna Pavlova, who visited New Zealand in 1926 and Australia in 1929. Lamingtons are a quintessential part of every Australian's childhood. The little sponge cake is dipped in chocolate icing and then rolled in desiccated coconut. These little treats are sold at school fairs and bake sales around the country. These days Lamingtons are also commercially produced however they don't taste as good as the homemade versions. A classic. Whether a leg or a shoulder cut, Sunday dinners with the family wouldn't be the same without it. This recipe is traditional. A small boneless lamb shoulder is simply seasoned with garlic and rosemary. The meat pie is considered somewhat of an iconic food in both Australia and New Zealand. And while over the years tastes have evolved, the pie continues to have a firm place in the hearts and mouths of both countries. The pies are filled with ground beef, onions, and gravy and topped with tomato sauce (ketchup). A favorite in many pie shops, individual pies are filled with delicious ground beef and gravy and covered with a crispy top of golden mashed potato. Fish & Chips down at the beach is a perennial Aussie and Kiwi favorite. The fish is usually coated in a light, golden batter (often made with beer) with a side of hot chips or potato scallops covered in salt and vinegar.